Thirty years ago I began building a light-flashing signal system to help my grandmother. Even when I was a child, my grandmother had very little hearing. By the time I was a teenager, she couldn't hear anything at all. Constantly worried that she would not hear if her loved ones called or visited, she felt isolated and frightened. Having experimented with electronics since I was seven years old, I was determined to make something to help her. What I first came up with was a system that flashed lights around her home in response to the doorbell, telephone, intercom and fire alarm system. It was remarkable how such a simple device eased so much of the frustration of her daily life. Although that system was perfect for her, it required running wires all over her house and took almost a week to install. I knew that for others to benefit from what I had developed for my grandmother, a wireless, easy-to-install system was needed. Encouraged by my family, I founded Sonic Alert to produce these new systems. After more than two years of additional research and development, I came up with our first product, the Sonic Alert System, which was unique enough to be awarded a United States Patent. Since that time Sonic Alert has continued to grow and we have expanded our product line to include the many items you will find in this catalog. I hope that our products can help you or your loved ones as much as they helped my grandmother. I have had hearing problems since I was a child. I often developed ear aches and at one point they considered giving me a hearing aid. Since then, I have been to dozens of concerts with loud speakers blaring, which probably has not helped. I also discovered from an ENT Doctor that I had an enlarged muscle in my right ear that was causing wax problems due to my earaches as a child. He told me he had never seen anything like it. Needless to say, I often have alarm clock issues. My alarm clock has to be LOUD and it normally startles me awake. In addition to the dual alarm, I love the large display because my eyes are really bad. I had a wall clock right beside my bed and I still couldn't read the time without my contacts. 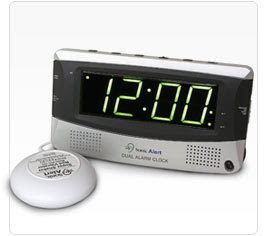 With this Large Display Dual Alarm Clock I can read the time! You have no idea what a big deal that is for me. I used to have to ask my Husband and he likes to mess with me, so I never knew if he was telling me the right time. Another feature that is amazing is the Super Shaker. The Super Shaker is a vibrating disk that you can place under your pillow or mattress. I placed mine under my mattress. It vibrates just enough to gently wake you up, and it is small enough to where you don't feel it when you lay on top of your mattress. With the combination of the Super Shaker and the LOUD adjustable alarm tone, I have been able to wake up easily. This system is actually designed to wake the deepest sleepers (me!) gently without startling you awake. It definitely works! You can choose to do just vibration, just alarm tone or a combination of both. All three ways work excellent for me, but I like the combination of both alarm tone and vibration. The alarm tone is so loud that I have it currently set on 3 out of 10! You can also control the tone. This alarm clock is definitely made to be adjusted to your personal preferences and needs. Go to the Sonic Alarm website to watch a video on this alarm clock and see the features in action. Sonic Alert also has other products such as amplified telephones, doorbells and amplifiers. Visit Sonic Alert and tell me one other product you would like to have (can be an alarm clock or something else). Giveaway ends 5/19/10 at 9pm EST. Giveaway is for US residents only. No P.O. Boxes. Winner will be chosen randomly. Winner will be contacted via e-mail and then will have 48 hours to respond before a new winner will be chosen. Facebook Fan of YOUR blog. I like the Phone Signaler Alarm Clock. I like Headset for CLA9 & CLA9T . Another product I would like to have is the Bedside Travel Alarm Clock with Bed Shaker. I like the sonic bomb alarm clock. It has big enough numbers, I can see it without my glasses on. I'd like the Sonic Bomb™ with Super Shaker™ - SBB500ss. I follow publicly via GFC. I like their sweetheart alarm. Amplified Cordless Telephone with Caller ID, 2 Handsets. Husband is hearing impaired and wears aids in both ears so this would be perfect for him/us! I like the Amplified Corded Telephone with Talking Caller ID. I would like to try the Bluetooth Enable Listening Device. I'd also like to have the bedside travel alarm clock. with Talking Caller ID - AmpliVOICE50 looks like a great product. Analog Alarm Clock is my fav! with Caller ID, Two Handsets. I like the sweetheart alarm. I like this, maybe it would actually work on my sons! Sonic Bomb™ with Super Shaker™ - SBB500ss. I like the sweetheart clock! I also like the Combination Alarm Clock. Anything that can help get my husband out of be in the morning would help. with Caller ID, Two Handsets - Ampli250-2. I also like the Cordless Phone with amplification, caller ID and 2 handsets. I like the sonic shaker travel alarm! I like the Sonic Shaker™ - SBP100 Travel Alarm Clock.